NeoRemote doesn't have any user interface, it just sits quietly in the Dock, doing its job. 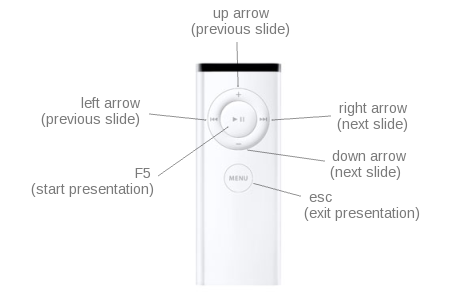 When you're finished with your presentation, and would like to go back to using your remote with Front Row etc., just right-click on NeoRemote's icon (or control-click, or click and hold, if you only have one mouse button) and choose "Quit". If you have any problems running NeoRemote, or, even better, if you find that it works perfectly on your Mac and would like to say thanks, please contact the author, Jacek Fedoryński, at jfedor@jfedor.org. I would be especially grateful for any reports on whether NeoRemote works on Snow Leopard. Do not hesitate to drop me an email if you have any other comments or questions. You don't need to know that to use it, but in case you are interested: NeoRemote is written in Python and is a really thin layer above Martin Kahr's library Remote Control Wrapper. If you'd like to see NeoRemote's source code, click here.